Even the most careful of motorists are at risk of being involved in a road accident these days. Being cautious on the road may help you feel safer, but it doesn’t lower the risk of accidents that are caused by someone else. With so many vehicles on the road nowadays, it helps to have protection just in case you are unfortunate enough to be involved in a non-fault accident. Motor Legal Protection is a simple and comprehensive way of reclaiming uninsured losses after an accident that wasn’t your fault. It provides protection for you and your passengers if you’re involved in a non-fault accident and will give you peace of mind that you’ll have an experienced legal professional to handle the process of reclaiming your uninsured losses – a benefit which will save you time, effort and money. 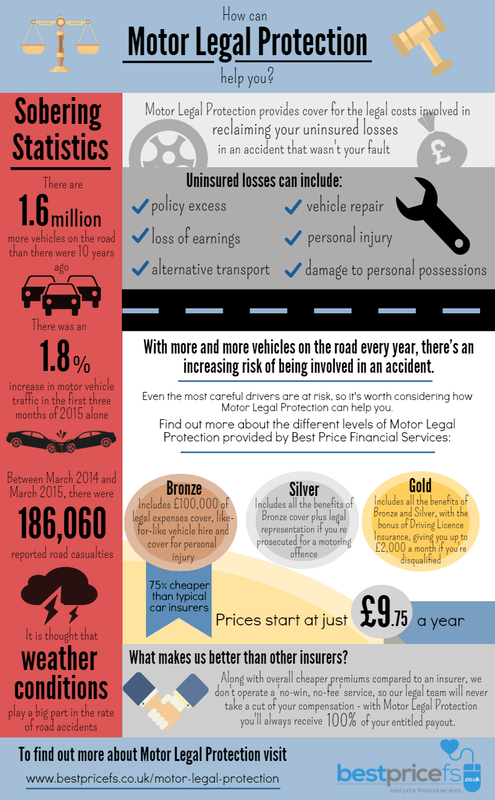 Best Price Financial Services offer three levels of Motor Legal Protection cover to suit your motoring needs, which start from just £9.75 a year. You can choose from Bronze cover, which gives you up to £100,000 of legal expenses cover to reclaim your uninsured losses, and unlimited like-for-like vehicle hire; Silver, which provides you with all the benefits of Bronze cover, along with with Motor Prosecution Defence cover with up to £100,000 of legal representation in the case of accidents that were your fault; and Gold, which includes all the features of Bronze and Silver cover, and gives executive cover for drivers with six points or less, providing up to £2,000 a month if you’re disqualified. With policies from Best Price FS, you’re always entitled to 100 per cent of your entitled payout, so not only will you pay cheaper premiums than with typical car insurers, but you’ll pay no commission on your compensation, as you would with no-win, no-fee services. To find out more about the cover we offer, visit our Motor Legal Protection page.